Having been the maintainer for Titan Panel [Quests] for the past 6 years, the decision I had to take was not easy for me to do. Unfortunately, I have to admit that priorities for myself simply changed during the past two years and I won't get back to play WoW any time soon. Not playing WoW also means that I would not be using (and testing) the mod I'd develop. To ensure a good product quality, one however really needs to utilize ones own product. Not doing so, one cannot really ensure the delivery of high quality software products. For a product which I stand by with my name, this would be unacceptable to me and hence I decided that it's best to pass on the mod into the skilled hands of another developer who is willing to put the necessary effort into the mod which is needed to continue the development. If you are interested to take over and become the maintainer of the mod, please contact me (best by mail at: luke1410 [AT] gmx [DOT] de). Titan Panel [Quests] (or short: Titan Quests) is a plugin for the WoW addon Titan Panel. It was originally developed by Corgi/Ryessa with smaller updates being done by PcHaXoR and r3neGaDe and then taken over by urnati for about 2 years. Titan Quests adds a new button on Titan Panel, granting direct access to the quest list and some quest related functionality. In early 2009 I began work on a first update to figure out whether maintaining the plugin is still feasible and with all the changes made to WoW meanwhile still provides enough useful functionality before I began working on completely refactoring the entire addon in November 2009. Just before releasing the beta 1 of version 1.0.0, I realized that urnati had already been maintaining the plugin for the past two years; not only fixing compatibility issues but also adding a lot of new features to Titan Quests. After getting into contact with him we agreed on merging the two code bases into a single one and since he's now more actively working on the Titan Panel main project, he offered to pass on the Titan Quests project to me, which I gladly accepted. Hence, the first released beta version based on my code was version 3.0.0 which incorporated most of the new features urnati has been adding to the plugin and added a couple of new as well as some features from the older versions. This list shows the major features which have been added and all (including minor) features which have been removed from Titan Quests in version 3.0.0. The system to display a message when a quest-relevant event occurred (like killing a quest target, etc.) has been removed from Titan Quests, since this feature is now considered outside the scope of the plugin. If there really is no suitable addon already around providing that functionality, it might be considered to be realized in a separate addon later. Even though there have been several changes to significiantly boost performance since version 1.0, some use-cases could be improved to further increase the performance by up to 50%. In earlier versions of WoW the quest watchlist was reset whenever the player logged in/out of the game. That meant that players always had to reactivate the quests they wanted to track between sessions. Titan Quests stored the watchlist and upon restarting the game, restored the watch list entries, so the watchlist became persistent. In one of the later updates to WoW Blizzard made the default watchlist persistant itself, effectively removing the need to provide this functionality ourselves. Earlier versions of Titan Quests provided a toggle menu which allowed toggling of several 3rd party quest-related addons (like Monkey Quests, QuestIOn, Quest History). This caused a significant work-load on maintaining this functionality, because all the provided addons had to be checked for updates on a regular basis. Furthermore, the usability of integrating other 3rd-party addons into Titan Quests is questionable in my opinion, since I merely see it as the responsibility of the 3rd-party programmer to provide integration into Titan Panel themselves since they are in a far better position to keep up with any required updates and I doubt that many users of Titan Quests used the toggle-feature anyway. Restored the 0.24 button coloring behavior which colors the number of completed quests on the Titan Quests button green and the number of total quests in white, in order to use a consistent green coloring for completed quests. Though the output print to the chat when the addon has been successfully loaded might be useful to prevent user errors it also spams the chat-output. If each addon would print such a message, players with 50+ addons would unnecessarily be spammed whenever they start WoW. Hence, the initialization message will be removed. Useful hints will be displayed which point especially new users to the shortcuts they can use within TitanQuests. For those of us like myself who haven't realized that there has been an updated version on wowinterfaces.com around for the last two years, the following list summarizes the major features which have been added since the early versions of Titan Quests as well as all features which have been removed (most of them because WoW meanwhile provides the specific functionality itself). Mousing over an entry in the questlist presents not only the quest-objective but rather the summary, detailed information, rewards, etc., now. The layout of the Titan Quest tooltip has been redone to improve readability and add additional information like the number of total/completed quests or the time when the instances reset. 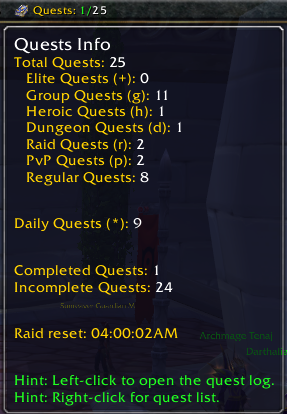 Titan Quests supports daily quests which have been introduced after WoW 2.0.4. All restrictions to watch quests have been removed, so that any number of quests can now be added to the watchlist. The plugin listens only to those events it is interested in and updates the questlist only when necessary. Rather than regenerating the questlist whenever the player opens the Titan Quests questlist, it is now being stored in memory. This caching of the questlist significiantly boosts the performance when accessing the questlist and fixes all cases which previously caused notable delays and stuttering (alltogether the performance was improved by up to 99%). Whereever it was used, we now use the default WoW quest log. The only purpose of having a separate quest detail frame was to provide a larger and movable quest frame. Meanwhile, the default quest log was updated several times and itself became movable and its size was increased, so there's no longer the need to provide a separate quest log. Furthermore, using the default quest log allows better interaction with other addons which replace/hook into the normal quest frame. Since the toggle menu was removed, the toggle function of the quest log was removed, too. To provide a better/simpler way to toggle the quest log, the functionality was added to open/close the quest log by simply left-clicking on the Titan Quests icon in the Titan Panel bar. At the moment there are no plans to extend the functionality further. Only updates to ensure compatibility with WoW updates are planned atm. If you are interested in participating in the development of this addon, please contact me by mail at luke1410 AT gmx DOT de. improve integration into TitanPanel by making use of the newly provided functions to display/hide icons, text, etc. * changed prefix for daily quests from "y" to "*"
* fixed the ZIP file folder structure and removed DS_Store file and _MACOSX folder. I also added a RAR version of the mod. * fixed bug when clicking on "Quest Details"